Castellanos RBI single in 8th snaps 1-1 tie, lifts Detroit past Boston. 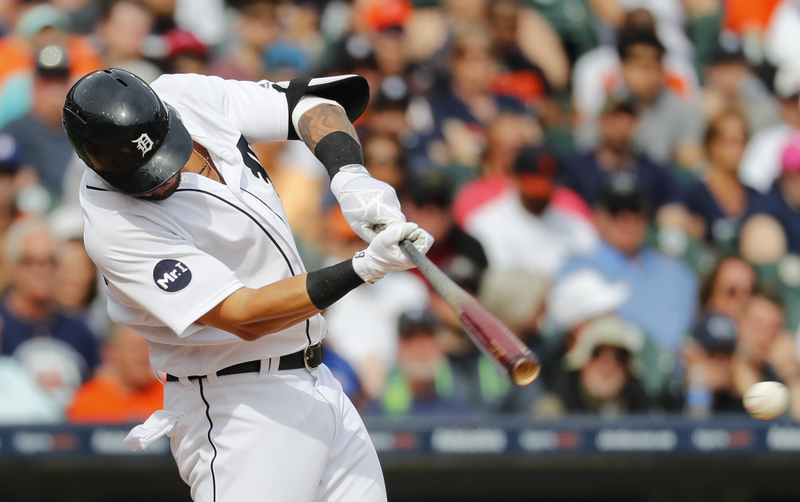 DETROIT — Justin Verlander and Chris Sale dominated in a matchup of ace pitchers before Nicholas Castellanos singled in the go-ahead run off Sale in the eighth inning, lifting the Detroit Tigers over the Boston Red Sox 2-1 on Monday. Verlander gave up an unearned run, three hits and two walks while striking out four over seven innings. Justin Wilson (1-0) struck out one and walked one in the eighth and Francisco Rodriguez struck out two and allowed a hit in the ninth, earning his second save in three chances to helping Detroit win the four-game series. Sale (0-1) struck out 10 and gave up two runs and five hits over 7 2/3 innings in his second start with Boston. Ian Kinsler homered off Sale in the sixth. The Red Sox scored their only run in the second inning after Castellanos’ fielding error loaded the bases with no outs. Mitch Moreland led off the inning with a double and Pablo Sandoval followed with a walk. Chris Young hit a grounder toward Castellanos at third, and instead of potentially starting a double play, he couldn’t field the ball cleanly. Brock Holt then hit into a double play, scoring Moreland, and Verlander got Sandy Leon to hit an inning-ending liner to Castellanos. As good as Verlander was, the Tigers and their fans were thrilled with the performance of a beleaguered bullpen. Earlier in the day, Detroit sent right-hander Bruce Rondon to Triple-A and purchased the contract of righty Joe Jimenez. Rondon was once viewed as the future closer for Detroit, but the Tigers swapped him out for a 21-year-old Puerto Rican who has yet to pitch in the majors. The Comerica Park crowd groaned when manager Brad Ausmus went to the mound with two outs in the seventh to visit with Verlander. He kept the right-hander in the game much to the delight of the fans, who cheered even louder when Leon, the next batter, popped out to end the inning. Verlander raised his glove in the air to acknowledge a standing ovation, and Ausmus was the first person to shake his hand near the bottom step in the dugout. Red Sox: LHP David Price, on the DL with an elbow strain, had a 20-pitch bullpen before the game and may throw again Wednesday. Tigers: Outfielder Justin Upton was scratched from the lineup with upper back tightness. Red Sox: Begin a six-game homestand Tuesday night against Baltimore. Tigers: Host Minnesota on Tuesday afternoon in the first of a three-game series.